They’re called the “town deer” for a reason. They’re not “tame,” but neither are they skittish as are the deer just a couple of miles out of town. I would imagine a lot of rural towns have them, though I don’t recall seeing them when I lived in small towns in New England. But they’re all over Gold Beach and they have become used to humans. 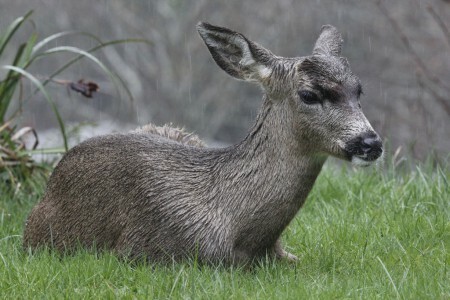 There are many mornings I open my front door, step out, and as many as eight deer are on the lawn, many lying down no more than forty or fifty feet away. They may eye me warily, but they often won’t rise to their feet, as long as I don’t do anything unusual. I’ve become so accustomed to their presence that there are times I don’t even notice them. More than once, while putting things in my car, I’ve walked around to the passenger’s side and jumped because I caught something in the corner of my eye that moved, and I looked down and saw a doe, just five or six feet away, watching me. I’d put my stuff in the car, close — not slam — the door, walk back around to the driver’s side, and I’m ready to go. 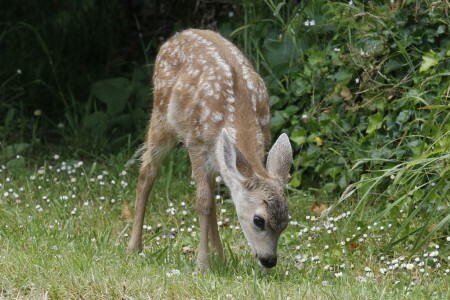 The newborn fawns, however, are inherently skittish and, if they see you, they run, and the mommies, though not usually afraid of me, run with them. However, given time — a month or so — the fawns become accustomed to me and don’t run either. If you live in the city, it may be hard to believe that wild deer will just lie there and watch you. But in Gold Beach it’s common. 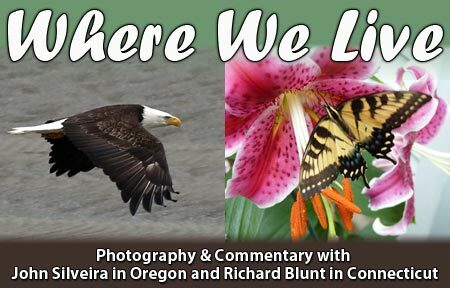 All of the photos here were taken with my old Canon 60D using my EF70-200mm f/2.8L IS II USM lens. The first three were taken from my front door. 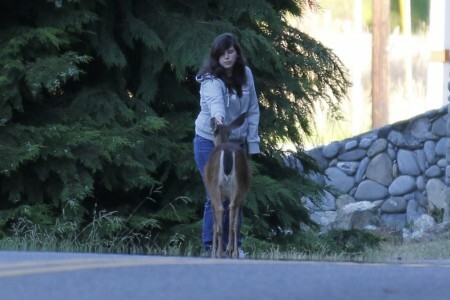 The last one, of the girl hand-feeding the deer, was taken on the north bank of the Rogue River near one of the resorts. I don’t know who the girl is. I’m assuming she was a tourist. I opened my door late in the afternoon, last November, and there he was. I stepped back in and grabbed my camera while he watched me. 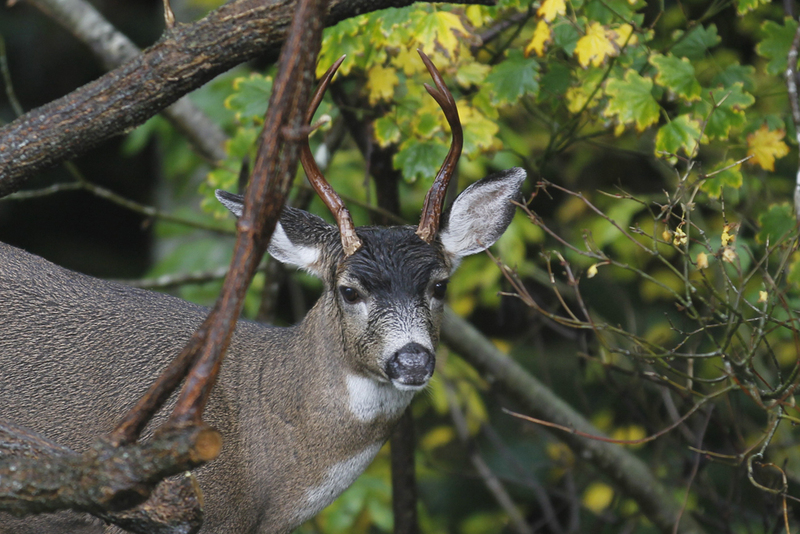 You don't usually see mature bucks, with full racks, here in town. I'd never seen this one before, and I never saw him again. It was mid-July, 2011, and this fawn was one that had finally gotten used to my presence so, when I stepped out with my camera, it looked at me only briefly then went back to eating. I'm not usually sentimental, but this one has about the most beautiful eyes I've ever seen. It rains here in the winter and the February afternoon this guy was on my lawn was no different. (Click on it to enlarge it and you can see the rain coming down.) If you look at its head, I think those are little nubs under its hair where antlers were going to grow, so I assume this was a young buck. This is the only photo of the four, in this post, that isn't cropped. The deer that hang out near some of the resorts are as familiar with people as the town deer. I was driving along the north bank of the Rogue when I saw the girl hand-feeding this doe. I pulled over about 200 yards up the road and took several photos of the girl and this almost tame deer.